This inflation guide explains why the inflation trend should be a major consideration in your portfolio asset allocation. Then we examine each inflation trend and analyze which asset allocation categories should be considered or avoided for increasing inflation, disinflation, and deflation. The inflation trend, or the direction of the rate of inflation, has a profound effect on how a portfolio should be structured. Historical studies show asset categories perform substantially different when the inflation rate is rising from when the inflation rate is declining (disinflation), or when prices are actually falling (deflation). The inflation trend is more important to portfolio performance than the actual rate of inflation at any particular time. Whatever the current inflation rate is, the valuation of investments has already adjusted to that reality. In other words, the price of an investment already takes into account what the current inflation rate is today. Empirical evidence shows price movements of asset categories are correlated with the direction of the inflation trend, not the absolute number at any given time. This means an important aspect of asset allocation investing is keeping track of economic conditions and the long term inflation trend. Asset Allocation is the most important decision in determining portfolio returns. There are many factors that affect your portfolio asset allocation, but the macro inflation trend is one of the most important inputs in making this important decision. Investors should periodically make changes to their asset allocation that coincide with the probabilities of each inflation scenario. Using an adaptive asset allocation allows investors to change their asset allocation depending on long term inflation trends and valuations of asset categories. Our inflation guide examines portfolio asset allocation for three inflation trends: increasing inflation, disinflation, and deflation. Increasing inflation can be caused by increases in the supply of money, increased access to credit, or demand that outstrips supply. In reality, inflation is usually caused by all or a combination of these factors. Large-Cap Stocks – Over weight stocks that earn a large portion of their earnings overseas and will benefit by a falling dollar. Underweight quality dividend paying stocks. Small-Cap Stocks – Historically small companies are more nimble and do well when prices are accelerating. Overweight small growth companies. Underweight small value companies. Foreign Stocks- International diversification can provide a bonus from a weak dollar. Overweight emerging markets and high growth foreign stocks. Corporate Bonds- Bonds as a category should be under weighted or avoided. As interest rates rise bond prices fall. Within the bond category high quality bonds should be under weighted; high-yield bonds over weighted. Treasury Bills- have one of the highest correlations to inflation of any investment. The upside can be increasing rates and safety not provided in bonds as interest rates rise. The downside is generally low returns. Inflation Indexed Bonds – In theory, Treasury Inflation Protected Securities (TIPS), and other inflation indexed bonds, should be over weighted because they have a high correlation with inflation. However the nominal yield is very important. Yes they are providing protection against inflation, but be sure you understand when to buy TIPS because sometimes the nominal yield is negative, possibly making them unattractive. Commodities- Over weight commodities because they have the highest correlation to inflation of any investment. This is the best time of the inflation cycle to own commodities. Gold & Silver – The best time of the inflation cycle to own Gold & Silver is when inflation is accelerating. 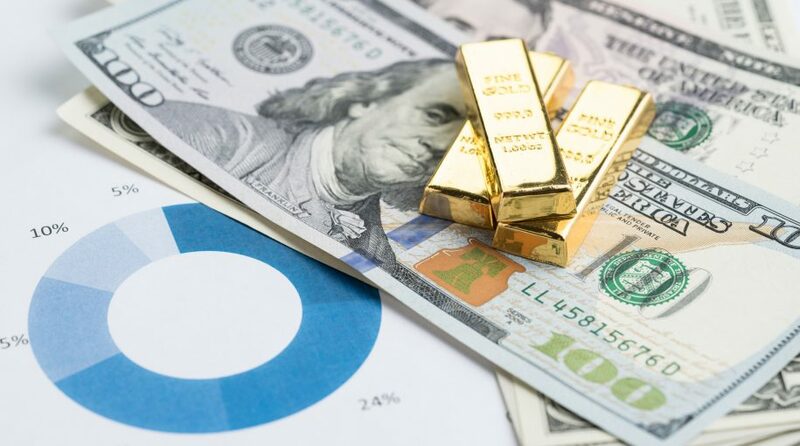 Gold and Silver can provide spectacular returns during these periods. Real Estate – The best time to own real estate is when inflation is accelerating. Real Estate has some unique problems too. Many people use leverage to buy real estate. Rising interest rates can hurt investors with variable rate mortgages and put downward pressure on real estate prices. Investing when inflation is increasing requires an asset allocation that factors in rising interest rates but takes advantage of the factors causing inflation. Disinflation occurs when the rate of inflation is decreasing and provides the widest variety of favorable asset allocation choices for investment portfolios. Historically, both stocks and bonds have done well when the rate of inflation is falling. Falling inflation rates can be caused by a sound and/or slightly restrictive monetary policy, stable credit conditions, and/or conditions where supply is equal to demand. In reality it is usually a combination of these and other unknown factors that cause inflation rates to begin falling from higher levels. Large-Cap Stocks – Overweight quality dividend growth stocks. Underweight stocks with overseas exposure that might be hurt from a rising dollar. Small-Cap Stocks – Small companies usually do well during inflation. Over weight small value stocks, underweight expensive growth stocks. Foreign Stocks – Markets that sell products to the United States usually do well. Emerging Markets in particular are well positioned to supply goods to a healthy U.S. consumer market. Corporate Bonds – Falling interest rates provide a favorable atmosphere for high quality bonds. Underweight Junk Bonds. Treasury and other High Quality Bonds – Safe investment that, as interest rates fall, provides capital gains in addition to paying interest. Treasury Bills – Underweight. Low and falling rates make bonds a better investment.